Sub-Calendars for iPhone: What are they and what are they useful for? When you sync your Apple Calendar (iCal) or Google Calendar (GCal) with CatchApp for iPhone, you can control which sub calendars are displayed in your CatchApp calendar, and which aren't. This is useful if you don't wish to display certain sub-calendars such as birthdays, meeting room reservations, or class timetables, for example. As can be seen in the example above, this user has decided to switch off her UK Holidays and Birthdays sub-calendars so that they don't appear inside of CatchApp when she is trying to pick times to offer for a meeting. Having this flexibility allows her to customise her CatchApp calendar to her needs. 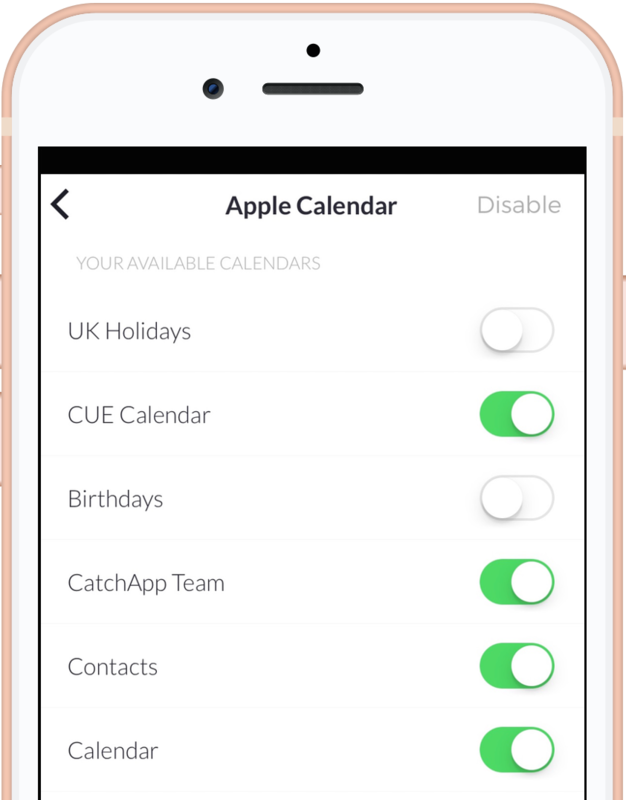 Sub-calendars can be accessed in the Settings section of CatchApp. For more information on how sub-calendars work and how you can use them to improve your scheduling experience, write to us at info@catchapp.mobi.